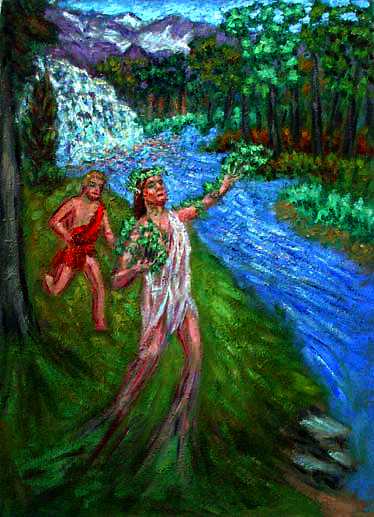 From Ovid's Metamorphoses, Daphne is a figure known as a naiad—a type of female nymph associated with fountains, wells, springs, streams, brooks and other bodies of freshwater. Because of her beauty, Daphne attracted the attention and ardor of the god Apollo. Apollo pursued her and just before being overtaken, Daphne pleaded to her father, the rivergod Ladon for help. So Ladon then transformed Daphne into a laurel tree.